What do former world chess champion Garry Kasparov, former State Department policy planning chief Anne-Marie Slaughter, former U.S. ambassador to Russia Michael McFaul, and big-name journalists Charles Lane, Jonathan Rauch, and Jeffery Goldberg all have in common? All of them think Russian President Vladimir Putin needs to man up and meet me in single combat in a location where he can’t have me arrested. @McFaul He's a fake martial artist. I can take him any time. @McFaul I reiterate what I said yesterday: Any time. Any place where he can't have me arrested. Initially, at least, there was no great groundswell of sentiment that Putin should fight me. McFaul “favorited” my tweets in these exchanges, but he didn’t comment on them. Most people, if they even noticed them, assumed I was kidding. And not a word from the Kremlin. But I wasn’t joking. I was, and remain, serious. Martial arts videos of Putin litter the Internet. So do shirtless images. He tangles with endangered species and supposedly wrestles bears. But for all his displays of the crudest forms of masculinity, Putin only fights people who are in his power, whom he can have arrested, whose lives he can ruin. And I think they’re all taking falls for him. In fact, they’re not really fighting him at all. I don’t pretend to have seen all of Putin’s martial arts videos, but I’ve watched a bunch of them, and they seem to follow a similar pattern: they involve some shots of Putin and others doing warm-ups, and then they involve a sequence of short clips, in each of which Putin throws someone who is prepared to take the throw; then there are warm handshakes and photo ops. At least in the videos I have seen, there are no committed attacks on Putin, and I see no evidence that his opponents are ever trying to get the better of him. The videos are demonstrations in which he shows off his masculine prowess with them taking what the Japanese call ukemi (defensive falls) for him. But there’s a very dark side to these displays, which are deeply connected to his aggression against his neighbors, his repression of dissidents, and his grotesque treatment of the LGBT community at home. That is, his self-presentation as a really "tough guy” who uses fighting arts to assert his manhood, parades around shirtless, and personally tranquilizes tigers is fully consistent with his behavior and designed, I think, at some level to justify it. The persona, that is, demands of others exactly what Putin’s policies also demand: submission and obedience. The other thing about these displays is that, as propaganda, they really work. Since I started tweeting and posting on Facebook about how Putin should fight me, numerous people have expressed concerns that he might do so and win. Even people who haven’t drunk the Kool-Aid do internalize the image he puts forth. That conditions the way lots of people respond to him. Why is Putin the #FearlessShirtlessOne ducking martial-arts challenge from middle-aged think-tanker @benjaminwittes? Global politics might never be the same if the #fearlessshirtlessone answered @benjaminwittes's challenge! Putin v. @benjaminwittes in a ring, both shirtless, would be something to see. Even the State Department’s most senior human rights official got into the act. 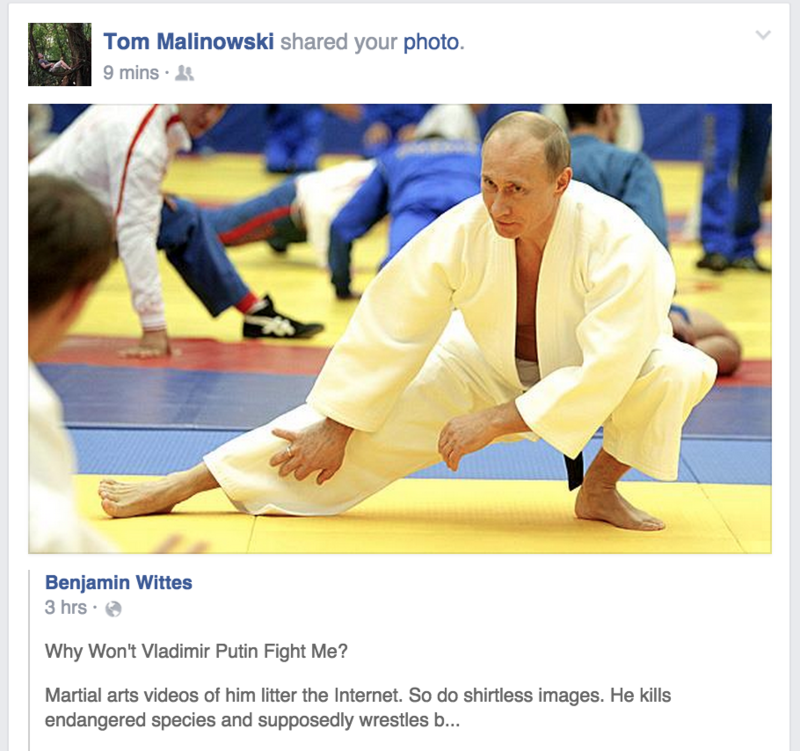 Tom Malinowski—assistant secretary of state for democracy, human rights, and labor—shared my Facebook post on the subject, “Why Won’t Vladimir Putin Fight Me?” (which you should also share), though he did so without explicit endorsement. So let me clear: No, this is not a joke. As I told the Fiscal Times the other day, I am prepared to meet Putin mano a mano any time, any place he lacks the jurisdiction to have me arrested. I’m flexible about style, the rules of the fight, and just about everything else. I am sure the Kremlin and I can work out all details once we agree on this basic principle: Putin needs either to fight this reasonably well-trained but not especially expert middle-aged desk worker in a situation in which I’m actually allowed to win without fear of reprisal, or he should face condemnation worldwide as a wuss and a phony. Let me be clear about something else as well: If he fights me, I won’t take falls for him. I’ll hit him, kick him and throw him to the best of my ability. The Brookings Order from Chaos blog is hosting a long running debate about whether Russia is strong or weak. Here’s my answer to that: A truly strong leader doesn't need to stage displays using lackeys subject to his power. He doesn't need to score hockey goals against people who have to let them through. And he doesn't need to use his carefully cultivated tough-guy image to menace either the vulnerable in his society or the people in neighboring countries. While he thinks about that, I’ll be waiting just outside (of Russia) if he wants to join me.